Metroking series 3D coordinate measuring machine is a reflection of experience of high accuracy measuring machine developing and manufacturing. Approved by multiple industries, the Metroking series become a typical model in the high precision measuring industry. It is fit for the high accuracy work piece measuring and curve scanning, also for official institution and the measuring of the standard piece. The Metroking series high precision CNC 3D coordinate measuring machine is using granite material, finite element design and gantry structure, ensure high stability and reliability. The granite cross beam, integrated machine base, column working stage and the Z axis form a full-closed framing structure, ensures the features of high stability, low deformation and outstanding thermal stability. The 3 axis of the Metroking series 3D coordinate measuring machine are using advanced soft steel wire synchronous gear belt as driving system, the running process will not create any noise, fast locating and long life cycle. The Y axis is using DUO dovetail guide way as driving system, 3 axis using center driving, the high accuracy linear scales are installed in the center position, restraining the offset of the axis movement, minimize the abbe error. Using high power servo motors, largely improve the motion control performance, achieves much better acceleration, braking, and rapid running. 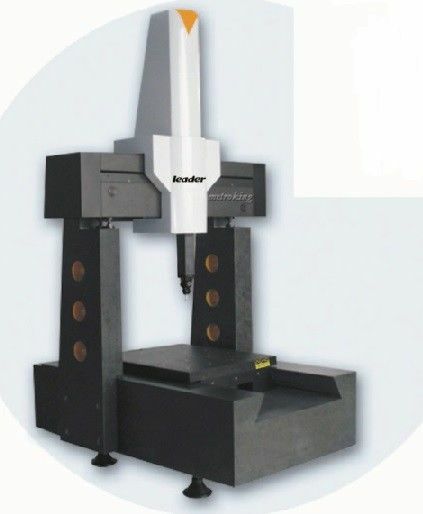 The Metroking series 3D coordinate measuring machine is using high performance air system, the Z axis is with air balance, improves the locating accuracy, also makes the movement reliable and smooth. 3 levels precise filter system, ensures a long life cycle of the guide way. Using high performance power cable and towline, ensures the stability of the electronics. Metroking series 3D coordinate measuring machine is compatible with full line trigger probes and contact type scanning probes. Also laser line scanning probes, high accuracy point scanning head and LV series high resolution CCD digital optical vision measuring head, to achieve high accuracy complicated curve high speed scanning (Reverse engineering), micro dimension high accuracy non-contact measuring.